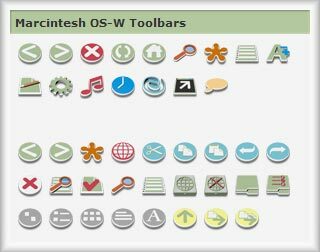 Toolbars from the Marcintesh OS-W skin. These are awesome. A sure thing 10 in my book...Great work! I have windblind 4.1 enhanced version but I can't apply the toolbar Icons.Please help me. Well was looking forward to download but i keep getting error report and message to send said report to Microsoft error reporting. Me thinks there's a conspiracy. Any help out there?? i've been sittin' here for like 3 hours now, i can't find a sulossion.. i just can't get it workin with this explorer bar... i've tried windblind, style xp, iconpackager and so on.. it doesn't work!! and bu-hu me cuz i realy like them cute icons!!! not working man, got my winblind crashed every try.